Welcome to Hamster Highlight, a column where we take a common or classic trope and take it for a new spin. 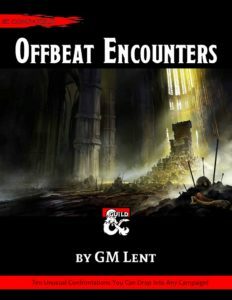 In keeping with our philosophy of Offbeat Encounters, we provide a few ideas on ways you could use these variant critters in your campaign. Take our ideas or leave ’em, but we’re sure you’ll enjoy ‘em. Of course, you may see these items reappear in other MGSHP products . . .
Gelatinous cubes get a short shrift. Sure, they’re slow, unintelligent, and are really easy to hit, but it’s foolish to write them off so easily. Try to imagine running into one in real life: it’s a humungous slab of hostile jelly, almost invisible, and full of acid. Just touching one can melt the very flesh from your bones, and agony awaits any creature unlucky enough to be engulfed by one. But what happens if a cube gets smart? What happens if it gains a rudimentary intelligence and grows larger? Its acid becomes more powerful, its pseudopods more cohesive? What if it adapts to its environment and starts releasing a scentless pheromone that causes creatures to come to it, instead of having to hunt for its food? Could one of these things actually prove challenging to a high-level party? You bet it could. And the Sucking God is an example of one such elder gelatinous cube. A dungeon room has exactly the dimensions of the cube, which fills the space. Both doors to this room open outward. Unable to leave the space but possessed of an insatiable hunger, the Sucking God entices even creatures who see it to become engulfed within reach. Trapped on the Ethereal Plane, the Sucking God proves a nasty surprise for any creature that happens to pop over for a visit. A gelatinous cube with another movement option could be scary indeed: imagine if the Sucking God could fly, and simply descend upon adventurers at an inopportune time (is there ever an “opportune time” to be dissolves in acid)? 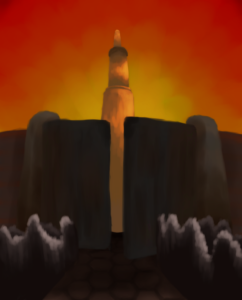 Any monster known to value toughness over strategy – kobolds, goblins, even ogres or hill giants – could easily turn to the Sucking God for protection. Kobold traps and misdirection could lead adventurers right into the gigantic cube, and such creatures might even worship the creature as an actual deity! Midnight in the City of Brass is Available Now! It’s an adventure! It’s a sourcebook! It has lovers! It has monsters! It has player options! It has a poster map! It has plot hooks! It is . . . Midnight in the City of Brass! This 86 page color, bookmarked PDF contains everything you need to bring your players to the efreet capitol and entertain them while they’re there. Summoned by an experimental spell and witness to an assassination, the PCs have three days to find an antidote to a powerful poison or remain as slaves to a cruel efreeti noble. Along the way, they will meet a lovelorn genie who longs for the affection of a devil princess, a human expatriate whose prophetic abilities couldn’t save him from the Grand Sultan, and the sinister followers of a disguised fiend. – A 32-page Tier 2 adventure balanced for 6th level characters! – A comprehensive guide to the City of Brass, including notes on its laws and customs! – descriptions and hooks for more than 20 districts and quarters in the city and its surroundings, including almost 100 keyed locations! – 9 new monster entries, including 13 stat blocks and variants! – A new player option called a character “Kit,” which is similar to a Background but adds depth to a character later in their adventuring career! – An ANSI E (34″ x 44″) sized digital poster map of the City of Brass, with a labeled and unlabeled option for both full color and printer friendly versions! Midnight in the City of Brass Is Coming! Here is the finalized Table of Contents for Midnight in the City of Brass! Part adventure, part sourcebook, Midnight in the City of Brass includes everything you need to incorporate the fabulous and wicked efreet capitol into your campaign. The book includes a 28 page adventure, new monsters, new character subclasses, and new type of character option called a kit! All of this, plus a comprehensive gazetteer for the City of Brass and its environs – including useful encounters and adventure seeds specific to each of the 21 detailed districts and quarters in and around the great City. The adventure and gazetteer section are both fully compatible with products published years ago, allowing you to incorporate longstanding NPCs, plots, and locations or just start building your own new adventures. Look for it in January from Miniature Giant Space Hamster Press. MGSHP bestseller Offbeat Encounters is available now for a special Thanksgiving weekend price of only $2.65! That’s 33% off the regular price! This is a great time to grab your copy, if you haven’t yet! Happy Thanksgiving, everybody! Be well, and stay safe. Coming in early 2019 from Miniature Giant Space Hamster Press, Midnight in the City of Brass is an adventure set in the titular city, wherein a band of unfortunately summoned adventurers must clear their names of murder before time runs out. Featuring all-new art from the stellar team of Belle Eisaman and Clarke Hughes, Midnight in the City of Brass includes a comprehensive sourcebook on the City of Brass, its environs, its people, and its ruler in addition to the adventure module itself. And best of all, everything is 100% consistent and compliant with sources from older supplements such as those from the Al-Qadim setting, allowing complete setting consistency with your longstanding cosmology and campaigns. 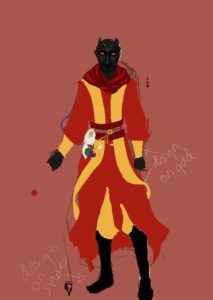 Warlock NPCs and Death Cultist Characters, Oh My! 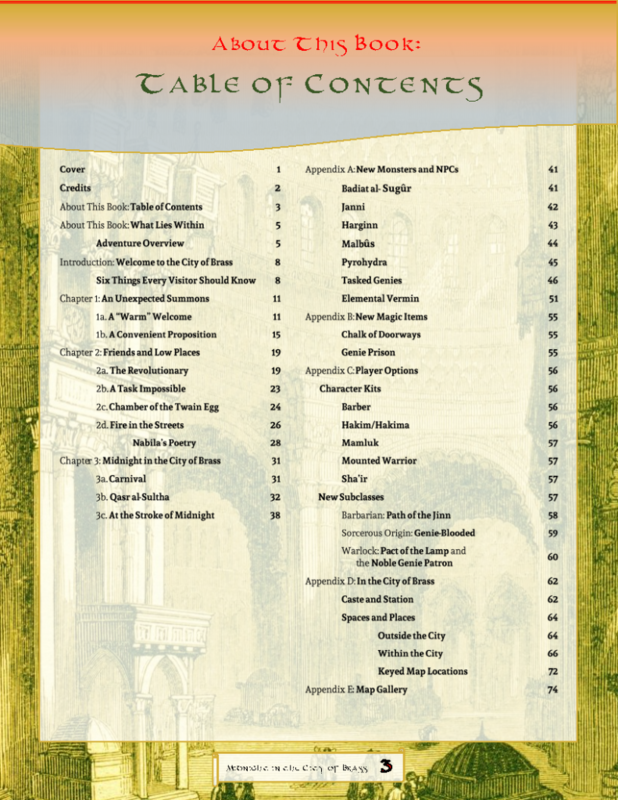 In case you missed it, our own GM Lent has two new articles up on the Kobold Press site: Cult Activity: High Priests LINK and The Sorcery Stop: Apostles of Oblivion LINK. High Priests provides a generic NPC template for the leaders of a warlock cult, formatted like the NPCs in the Monster Manual. Apostles of Oblivion examines the role of death cults in a campaign setting and provides a new warlock subclass: Warlocks of the Void, including Death itself as a patron. The Summer Magi is out now! 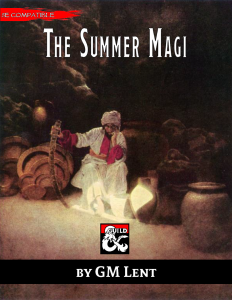 Available now at dmsguild.com, The Summer Magi is a short sourcebook detailing a group of nomads who venerate the summer in all its glory, bounty, and relentlessness. Including a writeup of the group’s beliefs and customs as well as new subclasses for clerics, sorcerers, and warlocks, The Summer Magi includes everything you need to add a fascinating new collective to your campaign! Coming Soon from Miniature Giant Space Hamster Press: The Summer Magi and Midnight in the City of Brass! The Summer Magi describes a nomadic group of poets, warriors, and philosophers bound by their devotion to the Blaze – a force they view as embodying the bounty and the ruthlessness of the summer. This 9-page color PDF includes a description of the Summer Magi and their ways, new subclasses for clerics, sorcerers, an warlocks, and a new weapon. Coming in mid-September 2018! Midnight in the City of Brass is a Tier Two (Levels 5 to 7) adventure module as well as a sourcebook, and includes a full-size color digital poster map of the legendary City or Brass. A daring assassination! A lovelorn physician! A sneaky salamander! A festival that starts at just the wrong time! A race against time to save a noble house and avoid years of servitude! All this and more, along with everything a Game Master needs to add the romance, excitement, and danger of the most dangerous metropolis in the Multiverse to their campaign. The adventure starts when the party is accidentally summoned by an efreeti sorceress seeking to perfect a new spell, and proceeds through layers of intrigue and great feats of derring-do fit for the tales of the most eloquent bards. Coming in early 2019! Welcome to Miniature Giant Space Hamster Press, where we only look small. 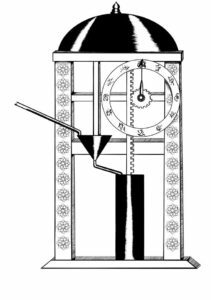 Miniature Giant Space Hamster Press is the brainchild of GM Lent, who may or may not actually exist in your space-time continuum. For the latest news, previews, and excitement, visit the What’s New? page. For an up-to-be-up-to-date listing of the various publications, please visit the Publications page. To find out more about who is behind what, visit the Contributors page. To see what’s coming, see the Future page.